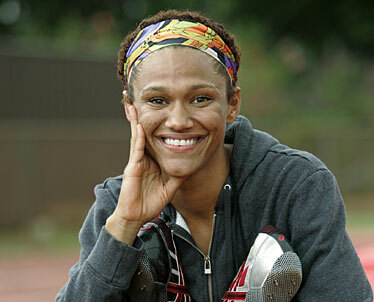 Adriane Sims Stone was the North Carolina state high-jump champion 12 years ago. From the pits of despair to the high-jump pit. It is truly a leap of faith for Adriane Sims Stone. Some 12 years removed from winning the high school state high-jump title in North Carolina, and off the national competition radar for seven, the 28-year-old has qualified for the U.S. Track and Field Olympic Trials later this month in Eugene, Ore.
Stone, wife of an Army sergeant stationed at Schofield Barracks and mother of three, cleared 6 feet at the May 4 Sunset Meet at Cooke Field. She met the "B" standard for the trials and is attempting for the second time in eight years to make the U.S. Olympic team. That she has recovered the form that led to her top-10 national ranking in 1997 is remarkable. That she has done so as a recovering alcoholic and two-pack-a-day smoker who weighed 230 pounds eight months ago is nothing short of a miracle. "It was the Lord. My faith was restored. I found hope in a hopeless situation. I hope that I can be an inspiration, especially to people who have given up. It's such a joy capturing life back." 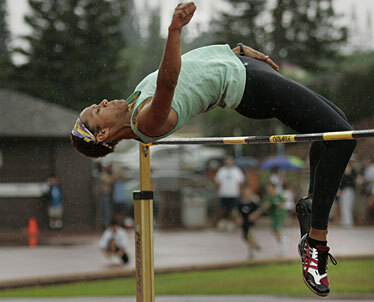 Adriane Sims Stone practices at Mililani High School's track, where she began coaching high-jumpers this year. And everyone, a theme song. There is little doubt what music plays in the head of Adriane Sims Stone. "Amazing Grace" is her story, a tale of once being lost and now being found. In the past seven months, the 28-year-old Stone has been transformed ... from a 230-pound hard-drinking, two-pack-a-day smoker to 150 pounds of Olympic high jump hope. During the May 4 Sunset Meet at Cooke Field, the former North Carolina high school state champion cleared 6 feet, meeting the "B" standard for the U.S. Olympic Track and Field Trials that begin later this month in Eugene, Ore. Faith or fate? Desire or divine intervention? In her soul, Stone knows that her God spoke to her in her darkest hour. After years of denial, she finally listened. "It was Nov. 1," she said. "I heard this voice saying, 'Come on, baby, come on home.' I said yes that day. "That day, I had no cravings, no withdrawal. I quit drinking and smoking cold turkey. I started walking and lost 30 pounds in a month." When her husband, Kenneth, an Army sergeant stationed at Schofield, returned from a deployment in Iraq, "he was overwhelmed," Stone said. "He hadn't seen the real 'me' in years. "It wasn't just the weight. It was the fire in me, the joy. I was happy and I was living life for the first time in so many years." Stone, born to a German mother and a U.S. Army father in Germany, was an elite athlete at Douglas Byrd High in Fayetteville, N.C. She won the state high jump title in 1996 (5 feet, 10 inches) and was ranked 10th in the U.S.
She went on to jump for George Williams, the legendary coach at Saint Augustine's College in Raleigh, N.C., and qualified for the 2000 Olympic trials in Sacramento. "The very day I jumped, my dad - who got me started, was my biggest fan - went to his first chemo sessions," said Stone, who failed at the preliminary height of 5-10.75 and was eliminated. Four months later, her father was gone and so was her spirit. Stone quit college (she eventually went back for her degree), met her husband and had three children in the past six years. The Army sent the Stones to Hawaii, where coincidence and timing collided. Last December, Adriane ran into her former college coach in Waikiki. Williams asked if she was jumping. "When I said no, he told me I had to go back," Stone said. "I started training and then I told my husband I had to go to North Carolina to jump again." In her first open meet in seven years, Stone had officials raise the bar to 5-7 - 7 inches higher than the normal starting height. She cleared that, and from January to May's Sunset Meet, she kept improving, hitting the "B" Olympic trial qualifying standard in the final meet of the season at Cooke Field. To add to the serendipity of the situation, a few months ago, the Stones watched a prep meet at Mililani's John Kauinana Stadium. Adriane offered to coach the Trojan high jumpers in exchange for use of the facilities. "She was a godsend," said Mililani coach Marshall Ochi, who ran track for Aiea and then Whitworth University. "None of our coaches had any training or experience with jumps. We were just making sure they didn't get hurt. "Just having her out there, seeing the joy she brings. She is a phenomenally gifted athlete. Watching her is like watching ballet, she's so fluid and graceful. She thanks me every day, but I owe her so much. She has inspired me, the coaches, the staff, the community and the school. She has inspired our athletes as well as challenged them." One jumper Stone has especially impacted is Andrew Longboy. The Mililani sophomore placed second in the recent state meet with a jump of 6-3. "He was a 5-10 high jumper last year and I thought he might reach 6 feet," Ochi said. "He has blossomed under Adriane. He has the potential to be a state champion." "She's great," Longboy said of Stone. "She has me jumping regularly at 6-4. She's done so much for me." One thing Ochi would like to do for Stone is find sponsors for her trip to the trials. "She's worked so hard to make it this far and she can't really afford to make it to Eugene," he said. "We hope her story will inspire people to help us get her there." Stone is going, as cliche as it sounds, on a wing and a prayer. She hadn't trained in three weeks prior to the May 4 meet, having come down with bronchitis and a possible vog-related reaction. She had the jump of the meet. There remains an outside chance that she and University of Hawaii qualifier Amber Kaufman could be supplanted by better jumps until the June 11-14 NCAA Championships. "I'm hoping to represent this wonderful nation I love," she said. "I jump at 7:15 p.m. (4:15 p.m. Hawaii time) June 30. It will be on USA Network. "I have my passport. I have my faith. I hope this is inspirational to people who have given up. I've been there. Life is given to us. We need to live it."